A hearty, thick, earthy experience for your taste buds, Meat and Mushrooms sauce is packed with the freshest, local USDA lean ground beef and loaded with savory, thick-sliced mushrooms grown in eastern Pennsylvania. 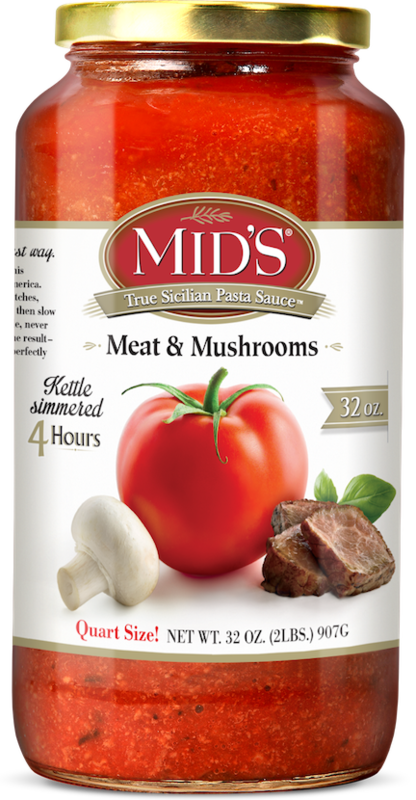 With 6 grams of protein in each serving, this all-natural, gluten-free sauce gets rave reviews from mushroom lovers. Try Meat and Mushrooms sauce as a hearty pasta topper or as a convenient, delectable lasagna ingredient. Ingredients: Water, Tomato Paste, Ground Beef, Mushrooms, (Mushrooms, Water, Salt), Sugar, Olive Oil, Salt, Onions, Romano Cheese (Made From 100% Pasteurized Sheep’s Milk, Bacterial Culture, Salt, Rennet), Citric Acid, Garlic, Spices, Paprika.